Very pleased, replaces non-height adjustable work stand. Have been using a Park PRS6 (non-height adjustable) for many many years, but the bending over to work on or clean vital bike areas has become more bothersome as time goes by. After reading reviews and looking at the Feedback stands for quite a while, I decided to go for it when it was on sale. It seems to be everything I had hoped for easy height adjustment, quality materials, very stable, quick-adjust clamp, not too heavy, easy to fold up and not too heavy to transport. I got the tool tray with it and together, they make tinkering and cleaning your velo-fleet much more enjoyable. I have found Feedback to be accessible and helpful with its products, as I also have the Feedback Table Top Digital Scale and had a few questions about it when I first got it. It's a clear win for me. Bought similar model 15 or so years ago that I liked until it broke this year, so I bought this model and it works well for my needs. Very happy so far. 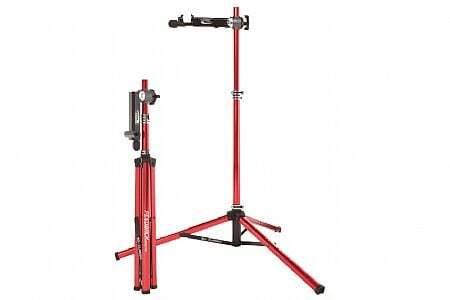 Classic work stand is very nice, compact and easy to adjust. The classic work stand is easy to adjust and put away. Multiple adjustment levers are nice and the clamping nob works well. Aero seat tubes may need some adjustments but not a big deal... My favorite part is that I can easily put away when done. All work stand should come with a tool tray but its sold separately. This stand is really good. I can adjust the height of the bike which is very helpful. I can also rotate the bike. It is well built and all clamps, adjustments, etc. work well. Very pleased with purchase, very well made and sturdy, holds fat bike no problem. So nice to have stand to work on bikes! I have an old Park benchmount stand, which is fine when I am working on bikes at the bench. But I wanted a free-standing stand for bike washing as well as other jobs where it's nice to be able to get around the bike and to adjust the height. I read a lot of online reviews, and the Feedback Sports range consistently rank at or near the top. The Classic seems to hit a sweet spot with nice features such as the slide-lock clamp. It's stable, solid, and appears very well-made. So far, I am very pleased with this purchase.